Extra power accompanies the top-trim Expedition Platinum. 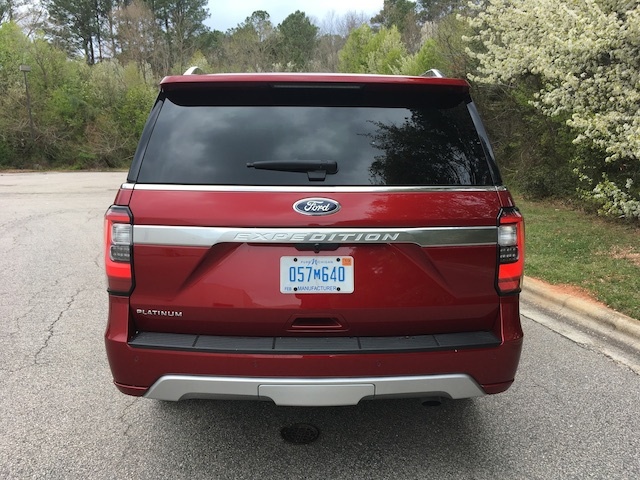 2018 Ford Expedition Platinum 4WD. Inasmuch as crossovers dominate the SUV segment, traditional models such as the Ford Expedition have an enduring appeal. Quite frankly, there are no other vehicles possessing the passenger carrying capabilities and towing power of full-size SUVs. The 2018 Ford Expedition launches the fourth generation of this full-size model. It comes in standard and extended wheelbase (Max) versions. Customers have their choice of XLT ($51,470/$54,475); Limited ($62,675/$65,365); and Platinum ($73,030/$75,720) editions. Add $3,010 for four-wheel drive and $1,195 for the destination charge. Employing a traditional body-on-frame design, the 2018 Expedition is based on the modified platform underpinning the Ford F-150 pickup truck. Many of the changes follow the current-generation F-150 launched in 2015 with its high-strength, aluminum-alloy body and high-strength steel frame. In all, Ford says the new Expedition is 300 pounds lighter than the outgoing model. Ford didn’t choose a radical design with the all-new Expedition and that’s a good thing. It has a more elegant visage than the F-150 as the truck advances its masculine rigor. My test Platinum test model builds on this SUV’s handsome frame by including a chrome grille. Additional chrome embellishments cover the mirror caps, roof rails, window surround and rocker panels. The rear offers blacked-out roof pillars, with the backside appearing all the more massive in the extended wheelbase MAX. Standard equipment includes automatic headlamps, fog lamps, daytime running lights, power operated and heated side mirrors, a roof rack and running boards. Ford also includes 18-inch machined-face aluminum wheels. All four-wheel drive models have front recovery hooks. There is a long list of upgrades and options available with the 2018 Expedition. You’ll find LED fog lamps, roof rack rails, deployable running boards, LED tail lamps and a power liftgate. Package options add such features as a panoramic vista roof, an off-road package and a trailer tow package. 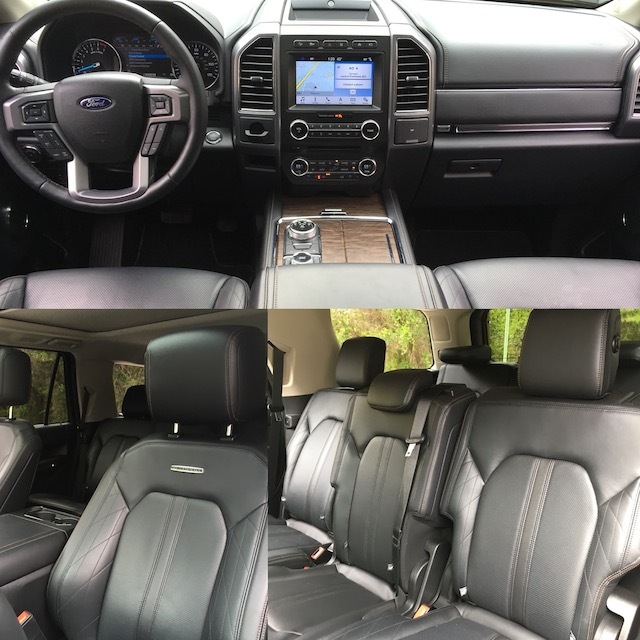 The Ford Expedition seats eight with plush bucket seats up front, second-row tilt and slide seats and a third-row bench seat. The dashboard layout is similar to the F-150’s with a large center console and a two-tier glove box. Open the lower tier and it is further split in half thanks to a shelf. Between the front seats is ample storage, including a deep cargo section. The available captains chairs reduce the passenger count to seven, but they offer ideal comfort. Your rear seated passengers will appreciate the additional maneuvering room and leg space. 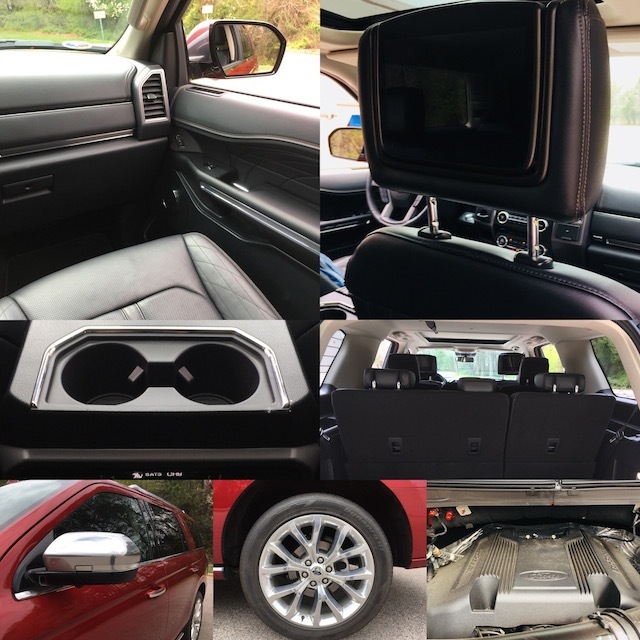 If you opt for the Expedition MAX, you’ll notice additional headroom. The Expedition followed the Lincoln Navigator in my driving rotation. The two are similar, although the interior of the Lincoln is a cut above. That said, the Expedition delivers a beautiful cabin, especially in Platinum guise. Real wood trim, lovely stitching and metallic trim supply this model with the panache you would find in a GMC Yukon/Yukon XL Denali. Figure that Ford had GMC in mind when designing the Platinum. The equipment roster includes a tilt-and-telescopic steering column, power-adjustable pedals, a power driver’s seat, cloth seats, air conditioning, cargo lights and a cargo management system. Available features include a power-controlled steering column, a heated steering wheel, dual-zone climate control, leather seats, heated and ventilated front seats, and heated outboard second-row seats. Leather door-trim accents, ambient lighting and cargo organizers are also available. 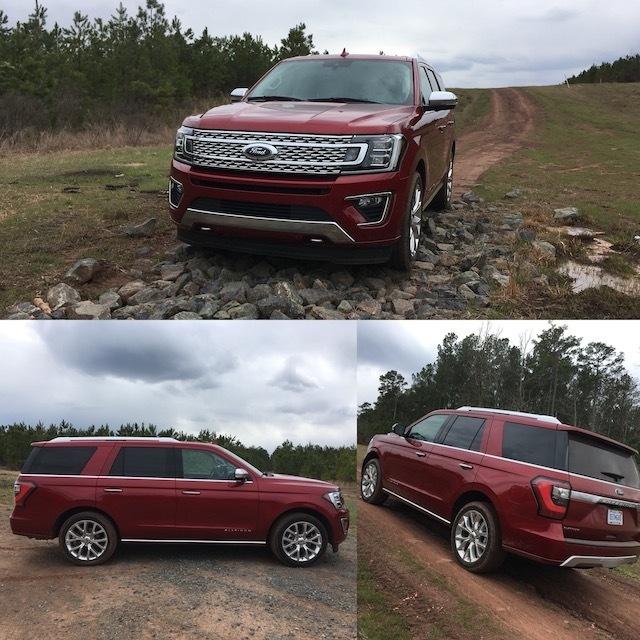 The 2018 Expedition offers one powertrain combination and a powerful one at that. Here, you’ll find Ford’s second-generation twin-turbocharged 3.5-liter V6 engine with two power ratings, depending on the trim. On XLT and Limited models, you’ll have 375 horsepower and 470 pound-feet of torque. Choose the Platinum edition and the performance numbers reach 400 horsepower and 480 pound-feet of torque. Ford pairs this engine with a 10-speed automatic transmission. The performance numbers are strong, although they don’t match the high output numbers of the Ford F-150 Raptor pickup truck or the Lincoln Navigator SUV. Those two models have 450 horsepower and 510 pound-feet of torque to work with, thanks to larger turbos and other enhancements. As for the model at hand, I had to remind myself several times that it wasn’t a big V8 moving the Expedition, but an even more powerful twin-turbo V6. The turbos spool up quickly and help this SUV move with authority. Only on occasion did I notice the transmission as it moved up and down the gear range — it was that unobtrusive. Otherwise, the engine and transmission make for a happy pairing. The Expedition shows its off-road chops too. A new off-road package supplies up to seven drive modes with Ford’s Terrain Management System. On my first full day with this SUV, I took it to my favorite off-road haunt with ample amount of ooze, sludge and muck along the way. A 10-foot tall hump was the perfect specimen for testing approach, break over and departure angles — the Expedition conquered it. Everything else that followed was comparatively easy, although I avoided one clay bog and its siren call inviting me to likely disaster. If you’re planning to tow, the Expedition delivers a 9,300-pound towing capacity (9,100 pounds with the Max). These numbers rival what some pickup trucks deliver. 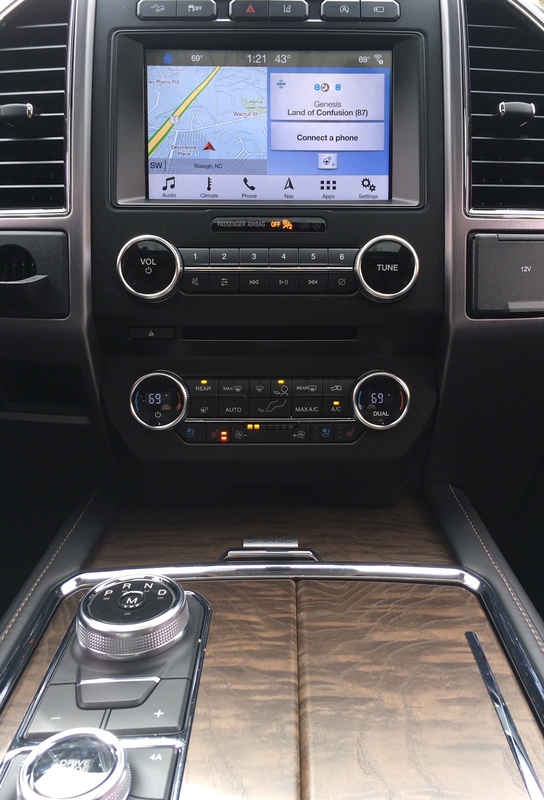 In the past year, Ford has made some big improvements with its technologies, including its available SYNC 3 interface. Where the previous system was an exercise in frustration, the current one is uncomplicated and easier to use. The standard audio package includes a nine-speaker system with a CD player and one charging USB port. Move away from the base model and Ford supplies a 12-speaker B&O system, voice-activated navigation and a 110-volt outlet. You’ll also get SYNC telematics, two USB ports, and AppleCarPlay and Android Auto smartphone compatibility. A Connectivity Package is available with the base model and comes with the other trims, bringing in Wi-Fi hotspot capability, a wireless charging pad and two additional USB ports for the third row. All models come with a rearview camera. Available driver-assist technologies include a 360-degree camera, a blind spot information system, forward sensing warning, pre-collision assist with pedestrian detection, a lane keeping system and adaptive cruise control. The Expedition also has an enhanced parking assist package for parallel parking, reverse perpendicular parking and park out assist. So, which Ford Expedition will you consider? Standard or extended wheelbase? Two- or four-wheel drive? XLT, Limited or Platinum trims? If you’re a current Expedition owner, making the transition could very well begin with the Limited. Choose four-wheel drive if you regularly tow or if you like to head off-road. The extended wheelbase Max model is ideal for customers who haul a lot of gear. Well equipped, your 2018 Expedition may cost you about $75,000. That seems like a bargain when compared with the Lincoln Navigator I had the week earlier costing just over $100,000. All in all, the 2018 Ford Expedition does an excellent job in upholding the SUV banner for Ford. Its proven big truck architecture is a plus and the powertrain suits this SUV fine. If you’re cross-shopping the Expedition, you’ll want to explore the Chevrolet Tahoe and Suburban, the GMC Yukon/Yukon XL, Nissan’s Armada and the Toyota Sequoia. Nissan and Ford have the newest models, but if you want an extended wheelbase SUV, only Ford, Chevrolet and GMC deliver. Ford Expedition photos copyright Auto Trends Magazine. All rights reserved.